The F7 was the Electro-Motive's four entry in its line of freight service locomotives and proved to be one of the most successful designs of any type ever built. The model debuted directly after the F3 in the late 1940s and with EMD's success in the market up to that point railroads quickly placed orders for the F7. Once again, the latest F model proved efficient, rugged, and easy to maintain. Before production had ended on the F7 nearly 4,000 units were produced outselling all other manufacturers' designs, combined. The F7 proved so reliable and useful for many roads that hundreds remained in regular freight service through the 1970s and 1980s. Today, numerous F7s remain preserved and some even continue to haul freight, a true testament to their design. The most famous set (a pair of Bs) is the fleet owned by Class I Norfolk Southern used as part of its official business train. 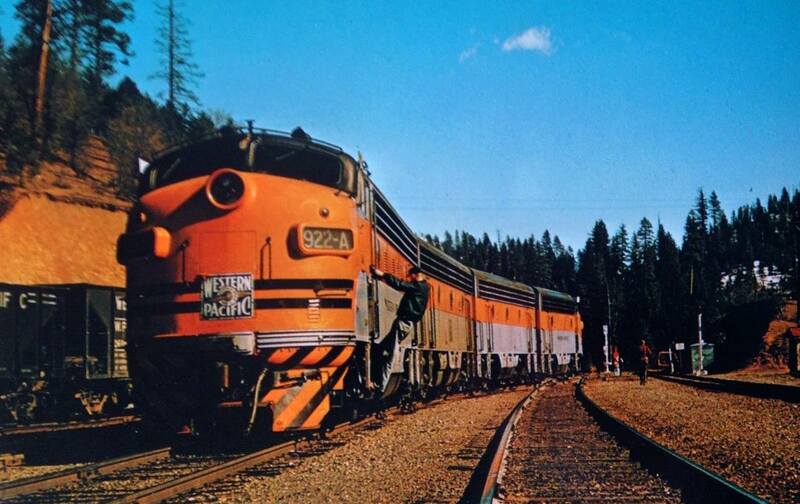 The EMD F7 began production in February of 1949. Internally, the model varied slightly from the F3 as it still carried GM's 16-cylinder, model 567B prime mover which could produce 1,500 horsepower. It did use a slightly updated generator, the model D12B, and traction motor, the model D27C, first used on the "F5", which was technically a late model F3 (EMD did not distinguish the locomotive as an F5, instead referring to the slight variants as phases). The new traction motor was meant to be more rugged and durable than the previous. However, it continued to offer the locomotive the same tractive effort as the earlier F3; 56,500 pounds starting and 40,000 pounds continuous. Using a similar frame design as the F3, F2, and FT the F7 was just over 50 feet in length and weighed 115 tons. Once again railroads very much liked EMD's latest F model and many which had yet to fully dieselize did so after their F7 orders were completed (wartime restrictions had still held back some lines from either starting or completing their change over to diesel power). The model was easy to maintain and very reliable; coupled with a matching 1,500 horsepower cabless B unit a set of F7s could double a train's power to 3,000 hp (in theory you could equip as many Fs to a single train as you wished, whether at the head-end or cut-in throughout the train). 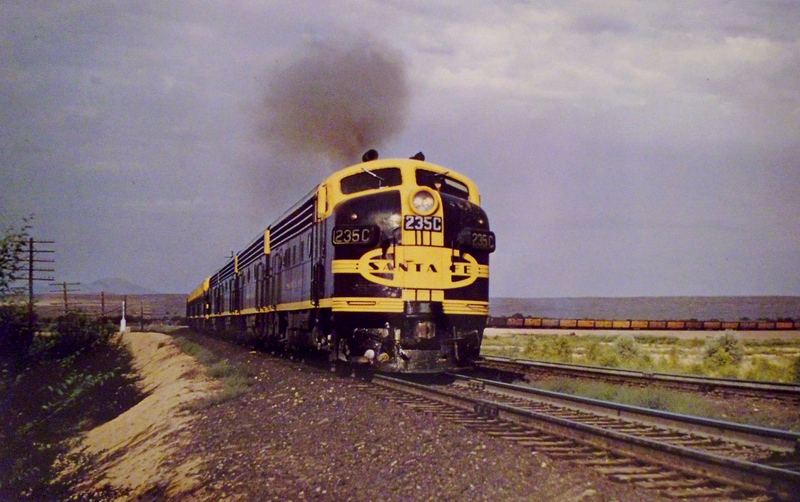 While intended for use in freight service, with their clean, streamlined design many F7s also found their way into passenger service alongside E units (notably on the Santa Fe which sometimes featured Fs on trains as posh as the Super Chief and El Capitan). As with the F3, EMD slightly upgraded the F7's carbody during its production run although most changes were primarily focused on the grille area. The EMD F7 was the SD40-2 of its day, the first true "common" diesel locomotive; thousands were built and could be found powering almost any train. When production had ended some 2,366 F7As and 1,483 F7Bs had been produced by 1953 just four years after the locomotive was first cataloged. According to an article by Don Strack, published in the November/December 1991 issue of "Diesel Era: Volume 2, Number 6" the, "base price on two cab units was $161,000 and the base price for two booster units was $147,500." 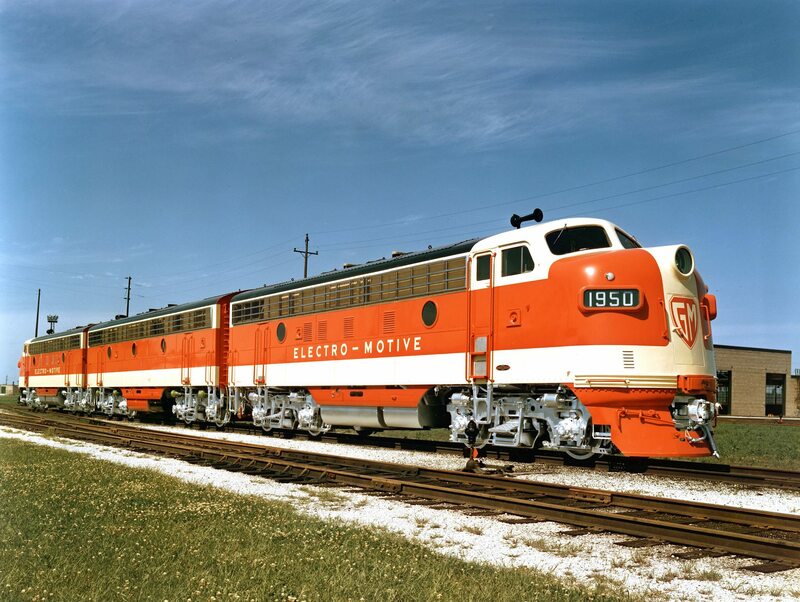 This was also the first instance of the Electro-Motive Division's new General Motors Diesel (GMD) subsidiary filling orders. Located in London, Ontario, the new plant made it much easier to sell locomotives to Canadian lines. In all, GMD sold 127 examples to the Canadian National, Canadian Pacific, and the Wabash for its line in southern Ontario between Detroit and Niagara Falls/Buffalo, New York. The model was EMD's most successful in the F series as no other future design ever came close to matching the F7's sales numbers. The EMD F7's reliability and ruggedness can still be seen today as dozens remain preserved and in operation with a handful still work freight trains, notably on short line Grafton & Upton. Other places one can still find F7s in use include the Conway Scenic Railway, Reading Company Technical & Historical Society, Adirondack Scenic Railroad, Royal Gorge Railroad, Illinois Railway Museum, Potomac Eagle Scenic, and the Fillmore & Western. The most famous F7s are those which pull Norfolk Southern's business train and carry a livery inspired by predecessor Southern Railway. They include A units #4270 and #4271 as well as B units #4275 and #4276.